Electric vehicles are coming – even from Gaydon, home of Aston Martin, which has just unveiled its first production EV at the Shanghai Auto Show. 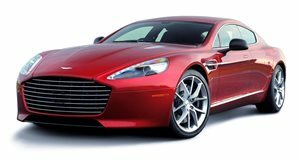 Following the concept showcased back in 2015, the finalized Aston Martin Rapide E is based on the four-door sports car that fist hit the market at the beginning of this decade. Only unlike every production version to date, the Rapide E ditches the V12 engine in favor of an all-electric powertrain, developed with Williams Advanced Engineering (the outside consulting arm of the F1 team) that helped (among others) Jaguar develop the aborted C-X75 supercar. In place of the old-school, naturally aspirated 6.0-liter V12, the Rapide E packs a pair of electric motors to deliver just over 600 horsepower and 700 lb-ft of torque. It's juiced by a 65-kWh lithium-ion battery pack sitting under the hood where the internal-combustion engine used to be. Running to 60 is said to take less than four seconds, with a top speed quoted at 155 mph. It'll run for 200 miles (on the European WLTP standard), quick-charged at 800 volts in as little as three hours (though it can still power up from the usual 400-volt charger). The chassis's been further refined from the Rapide AMR, with a limited slip differential channeling the power from the two electric motors to the rear wheels – alloys specific to the Rapide E and shod with low-rolling-resistance Pirelli P Zero rubber. And the aerodynamics, now unburdened of having to feed an internal-combustion engine, are more efficient for the electric model. Even the interior's been revamped, with a ten-inch digital display replacing the analog instruments, and carbon fiber used inside and out to help reduce the vehicle's weight. "Unveiling the Rapide E will be a huge moment for Aston Martin,” said CEO Andy Palmer. The Rapide E is the first vehicle to be produced at Aston's new St Athan factory in Wales. Only 155 examples will be made, with pricing available only to interested parties.